Fish & Rice Kibble is a wholesome and natural hypo-allergenic dog food for loose bowels and calming itchy and irritated skin. High in Omega 3 fatty acids, Fish & Rice provides a unique taste which dogs love whilst supplying the vital nutrients for maintaining optimum health for your dog. Added benefits comes from olive oil, which is high in mono-unsaturate fats and also from peas and chicory which is necessary for ease in digestion. Antioxidants - E306/Natural antioxidant: 200 mg, Vitamins - E672/Vitamin A: 15000 iu,E671/Vitamin D3: 1400 iu, Trace elements - E1/iron: 133 mg, E2/iodine: 3.3 mg, E4/copper: 20 mg, E5/manganese: 40 mg, E6/zinc: 385 mg. Protein 19.5 %, crude fibres 3.5 %, fat content 9 %, crude ash 6.5 %, Vitamin E 400 mg/kg, omega-3 fatty acids 1.5 %, omega-6 fatty acids 1.5 %. 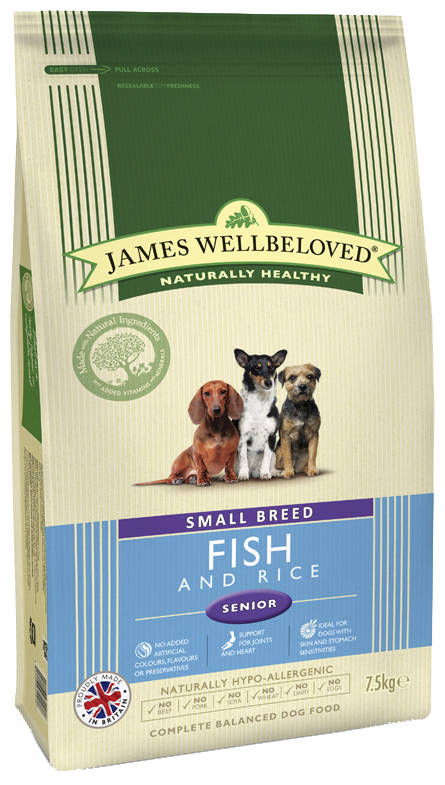 Below are some recent questions we've received regarding James Wellbeloved Senior Fish & Rice Dog Food, including answers from our team. My dog is 13 and showing signs she is in early stages of renal problems, is this food suitable? This is probably a very good diet for your dog. I would have to suggest that if these "early signs" are significant, you should get her checked by a vet (ideally including a blood and urine test). If the signs are mild and essentially she is good for her age, then the diet is likely to be very suitable. If she has significant renal problems, there are probably even better diets, depending on exactly what is her renal status and other health issues.